Today I returned from four days spent back in my hometown, but sadly, the reason for the visit was to attend funeral services for my grandmother -- up until this week, my last living grandparent. Following her services, my family and I took a quick drive by my grandparents' home which has been in my family for over a century -- the house where my dad was raised. With the funeral over and my kids desperately in need of a nap, we headed back to my dad's where my wife and kids knocked out for a while. Me? I took advantage of a few free hours and hit up some local junk shops. Inside the first -- a place that is a legitimate antique dealer -- I came face to face with something that had not crossed my mind in at least 20 years. Now don't get me wrong. I don't have any awesome memories of Fun Chicken. The only memory I have is plugging a quarter in one time and getting an egg with a piece of candy inside -- only the piece of candy had melted and solidified at least once inside the egg leaving nothing more than a sticky mess. But this thing sat inside one of the local grocery stores when I was a kid and I saw it often. Now here it was -- rusted and retired to the inside of a shed. Realizing that even if the price was right, I would be facing certain marital issues if I carted Fun Chicken home with me, I decided to venture on to another stop just up the highway. To the average passerby, this place looks like a scrap yard. But I'd been inside a few years ago and was feeling brave enough to go back. Aside from a fear of contracting tetanus, the inside turned up some cool items such as this old Double Cola bottle. For a few years back in the 80s and 90s, my uncle owned the Double Cola plant in Evansville, IN where they also bottled the nectar of the gods known as Ski -- so Double Cola stuff always jumps out at me. Or how about this stack of records, "carefully" stored in a room where I was scared to touch anything? A.) Nobody in their right mind stores records this way. B.) I was seriously scared to touch anything in this room fearing that an entire wall of stuff would come crashing down on me. Seriously. Then there was this. A stack of local high school year books in a store specializing in vintage and antique items. I'm in two of these yearbooks. Not quite sure what I think of this. After going home empty handed (for the record, I hit one more store the next day where I paid $1.50 for John Hiatt's Greatest Hits), I washed up and it was time for some food. What better place to eat on a trip home filled with nostalgia than the pizza joint that was once my high school hangout? There it was in all its glory. Same tables. Same chairs. Same wood paneling. Same overpriced thin crust pizza. I was glad to see a handful of video games still in there. These two are in a spot where I spent a lot of time standing on Friday nights in the 80s -- playing or waiting my turn to do so while my parents ordered pizza. Mario Bros. was up and running just outside the bathroom. A solid nod to days gone by. The jukebox in this place always sat in the same spot -- filled with 45s ready to be played for a quarter or five for a dollar. Now there's this contraption -- a touch screen with songs downloaded as they're requested. Sure they're keeping up with the times...but it's not the same. The next day was a little rainy and cool outside, but I took a few minutes to stop by my old grade school building where I attended kindergarten through 4th grade. The building has been abandoned for many years now and sits just up the road from my dad's house as a sad reminder of simpler days. Snapping a few exterior pictures with my phone, I approached the window of my 4th grade classroom and was disappointed to find that the screen and space between it and the window was just enough to keep me from seeing anything inside. But I thought I'd take a shot in the dark (pun slightly intended) and pressed my phone against the screen. Right before my eyes, with the eeriness of seeing a ghost, there was my class on the screen of my phone. 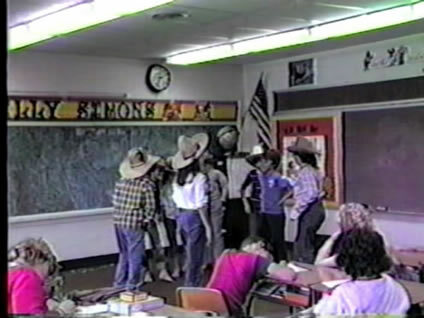 One blackboard had fallen off the wall and countless ceiling tiles had fallen to the floor. Wires hung freely and the floor was covered with debris. But there it was. My 4th grade classroom. The same spot I stood in 1986 when my class put on a performance of the Seven Silly Simons (amazingly taped and saved by the parent of a classmate). That's me in the sweet blue Ocean Pacific hoodie. The days go by quickly. Times change. Sometimes this is fascinating. And sometimes it's downright depressing. I can't wait to take my wifey back to Atlanta and show her around my childhood haunts as well. I can relate to the down right depressing part occassionally. I like the picture comparison of your classroom. Thanks for sharing. Wow. Left me totally speechless for many reasons—for one, you found some cool stuff in the thrift store, you found the old, old house where your dad was raised, and the bittersweet encounter with your old school. I'm fascinated with abandoned buildings; they're perhaps the biggest testament to the passage of time and the inevitable waning and deterioration of what was once precious. I feel the same way when I see big screen TVs abandoned on the curbside just waiting for the trash pickup.